Introducing CommCat Mobile for the iPhone! CommCat is now on the iPhone, iPod touch and iPad. Watch DX spots, control your radio, and log contacts from anywhere an Internet connection is available. CommCat Mobile is a free app available through the iTunes App Store. To learn more, check out the online help for CommCat Mobile and the CommCat Mobile Forum. CommCat 4 is a radio control and logging program for radio amateurs who share a passion for talking to other hams around the world. 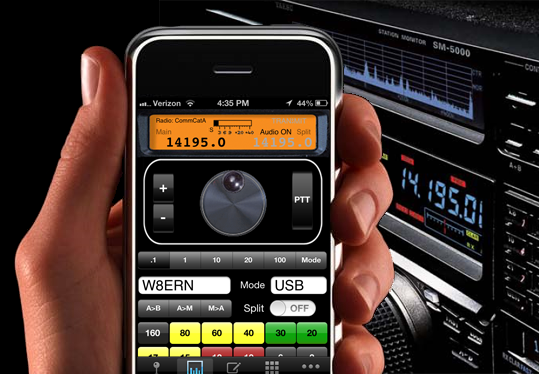 CommCat works with most popular radios and accessories. It requires a Windows XP or later computer. CommCat 4 is compatible with the Vista through Windows 10 operating systems. CommCat is packed with features to help you find and work DX. Its acclaimed rule-based spot manager filters incoming spots from the Internet and alerts you when a needed DX station is present. The DX Tracker and Band Spotter windows help you analyze activity and operating habits. The best way to learn more is to download the CommCat 4 demo and give it a try with your own station. You can view and print CommCat Help here. First take a look at CommCat the Movie by clicking the button below. Hams have understood social networking since their first CQ. Now you can have your own interactive web site on MyQSX.net and extend your ham networking to the Internet with CommCatLive. While you are on the air, CommCat feeds a stream of data to your home page so that others can see your current frequency, mode, beam heading and most recent logged contacts. A dynamic s-meter graph shows your radio's s-meter readings for the past minute so people you are talking to can see their own signal strength, compare their signal with others, and check antenna performance. Visitors to your home page can listen as you stream audio to the net, or play your recently recorded audio clips. Add a CommCatLive subscription to CommCat 4 and start enjoying your new home page on MyQSX.net. CommCat was introduced at the Visalia DX Convention in 2002. It is authored and supported by Howard Nurse, W6HN. Howard has been in the software business since 1979 when he wrote RTTY89, an RTTY program for hams that ran on the Heathkit H-8 computer. During the 80's and 90's, Howard's company, COMMSOFT, produced a popular program for genealogists called ROOTS. CommCat, CommCat Mobile, CommCatLive, and QSXer are Trademarks of COMMSOFT, Inc.